What we leave crumbles. It deteriorates. The roof that got showered with water above the bathtub that became a gaping, decomposed ceiling. Curiosity as to what happened over the passage of time to our homes begs questions. The lack of human presence combined with material decay promotes a number of narrative possibilities: from relatable human dramas to more sinister tragedies. That rotted out house at the top of the street is drawn as much from the pen of Edgar Allen Poe as it is cast from the lens of Hitchcock. Our media in the past year has too become increasingly adept at depicting deconstruction. Fukushima, Christchurch, Port-au-Prince, has made the living room our own Hitchcock. And yet most of our houses are not obliterated by shock, they rather deteriorate with time. The crack in the wall that we leave behind becomes moved by minute motion of the terra firma beneath it. 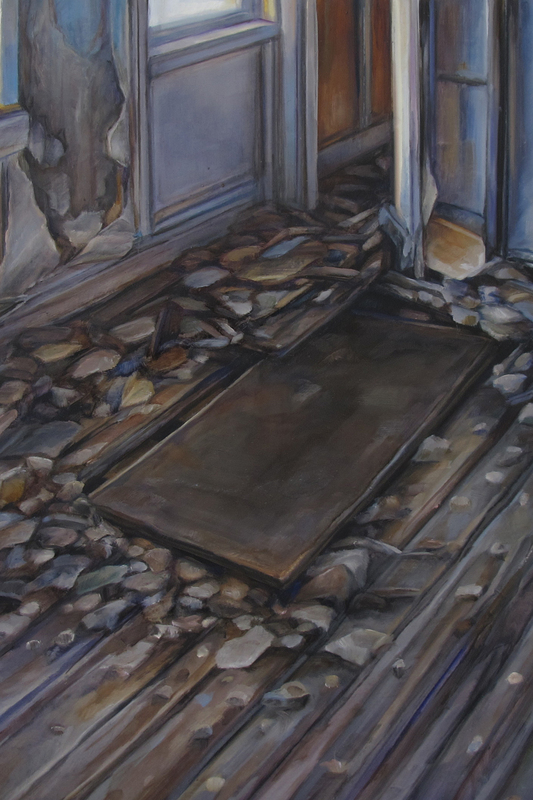 Throughout art the concept of the decayed house has been used to transmit elaborate semiotics concerning anxiety, social dynamics and domesticity. In her exhibition, entitled Deterior, Karla Marchesi paralyses the decay to depict her own version of a once enlivened dwelling. The decomposed interior is a framework to explore the uncertainties and transience modern living. Utilising relationships between objects, identity and the home as a site of meaning, Marchesi’s most recent works present the home as an elegantly vulnerable and unstable environment. Her interest lies in the objects that colour the everyday. These large-scale diamond orientated paintings feature flat fields of hue disrupted by a figurative form. This central motif depicts a cut-out passage of ceiling. 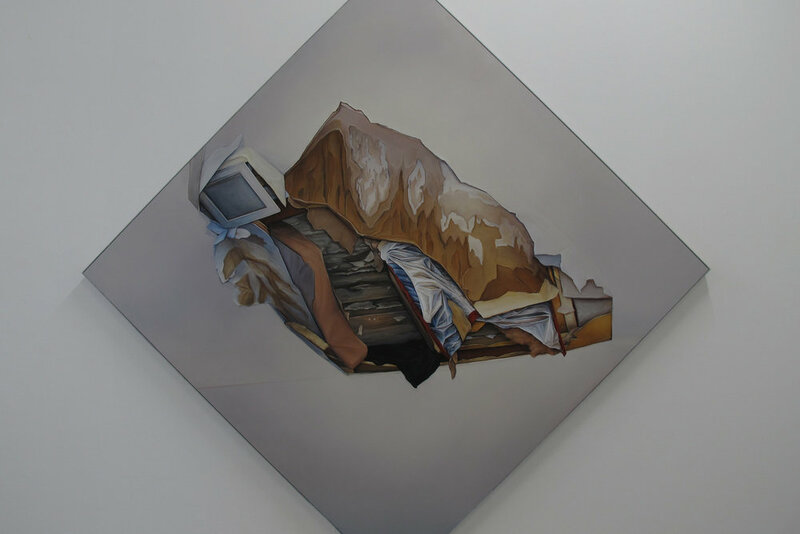 Revealing the internal structure of a domestic site, piles of insulation, decaying material and exposed wood appear animated on the paintings surface, as the viscera of the dwelling are literally poured onto the floor. Although the works of Deterior appear more Brothers Grimm than Home Beautiful, Marchesi’s work indeed embodies a curious beauty. She deals lovingly with the lost, forgotten, and neglected, as seen in her recent body of work, Left Behind (2010). In this 2010 collection, Marchesi depicts piles of discarded matter within public and private spaces with uncontrived emotional separation. Through the meticulous layered oil-painting process and care in which her works are painted, she discovers the pulchritudinous charm of now irrelevant items. Whereas Left Behind referred to still life and landscape painting, Deterior focuses squarely on the interior. Marchesi’s works seek to disrupt the notion of home as a site of nurture and stability, rather documenting the home as an impermanent and materially fragile site.